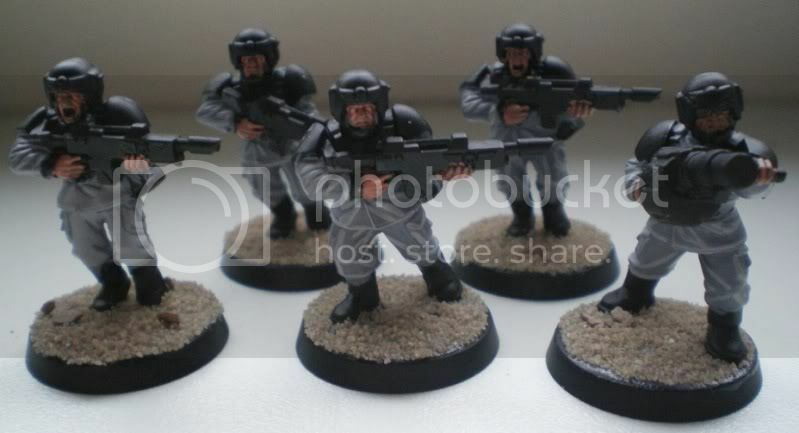 Since ive been starting all kinds off armys lately, heres my next project... my first 40K army, imperial guard cadians. But the question is for the greys i use. Im wanting to buy a wash that fits right in with this grey scheme. so,.. a grey wash :/ not to dark pls! what do you guys recommend? tomorow ill post another one which i painted a bit different but is still in progress now and not even comparable to the first one. 1) The red looks a little thick to me... did you get it to the consistency of milk when painting? All in all, a good start! first of all,... it takes a little time to appreciate the colours since almost 80% of the IG armys are green flak armour (from what ive seen) and it looks really weird seeing something like this :/ But when i was painting it, i loved it immedeatly! Even when it was just red flak with grey overall. The colours just seemed to fit together. Its my first camo ever, so i noticed some bits that need improvement. This includes mainly the shape of the red blobs. They scream a bit of 'cow' at the moment... so they need to be a little stretched out imho. But that will be done on the next soldier! This afternoon ill be visiting my store to collect some nice greys and washes and the like. I had to paint this model using only fortress grey. and since im not the best colourmixer, it was quite hard getting the grey to look nice. I think the model overall looks fine apart from some details you mentioned but a good wash will take care of that. The spots don't remind me of cows though...they look fine to me. The grey also looks surprisingly good as you had to work with only Fortress Grey. I'm sure if you buy one or two in-between grays it'll look even better layered. hej there, go and stop.... UPDATE TIME! standardbearer for example. and the 2 on the right. the vox caster is 'special'. why? well... its ment to represent my brother 40.000 years later Ill be putting all my friends and heroes in this army, if they would fit the model/theme. so,... hope you liked the update. and i hope the many pics arent a problem for the site/members, otherwise i will post more links and less pics. Oke, so i dont have my painting gear at home.. its at my brothers house. So i can only make scenery at home and paint at his place atm. Since im home, how about some scenery to fit the army. Then theres a WIP toll booth. And offcourse an overall view with a few armless model to see the scale off things and to see how they look together. Haha, I really like your soon-to-be M.Bison and Guile models. The Watchtower is looking impressive as well, I'm sure you'll be able to fix it up nice and proper, along with all those other constructions. hurray! had some painting going on,... allmost finished these little bastards! here are the pics. enjoy and comment pls. so,... tell me what you think! so, i like the stuff i got its not well painted (understatement) so it needs loads of work. But i got it fairly cheap and it should get me to some nice games! The red armour and metal areas looks good as well. Great work on your army so far, I really like the red/grey camo scheme you have going. How'd you create the plants like that? Run the exacto knife along the sprue? and another mini project started, guardsmam marbo is on his way! Hes kind of done, but i dont know... C&C are very very welcome! i wanted him to be the only model that would be stuck in the jungle kind of thing. Also, i wanted his stealthy-ness/move trough cover/hes behind you kind off rules to be very clear to see. Hes behind plants on a big rocky feature. that should give a nice feel on the battlefield eh? also, hes WYSIWYG, he has a kitbashed pistol kind of thing, a demolition charge (which i love... a huge pack TNT with a timer detonator on it ) and a heavy machette! still,... i dont know... he could use some more,... could be a paintjob, but could be more/less stuff on his base... C&C please! The machete looks a bit more like a scimitar. Love the kitbashed gun and the explosives rigged autocannon ammo drum. Perhaps a small ork choppa would make a better machete. The bottom guy looks ace, really dynamic. I have a little wip update for you all! the reds and blacks are done (most of em) but i still need to do lots of work on the blade, explosives, hair, face, and armour. :/... better get to painting then! He looks fantastic anyway can't wait to see him finished. Your models look great...even if the red does make them look like Khorne fanatics! I also like the fact you're naming the 'special' guardsmen-the ones with equipment. Ill be shure to put these to a correct version but, i dont want to waste the shoot i had with this awesome character! (fluffwise that is ;P) So i present to you, 95% finished marbo! I also intented to do a facial cammo,... like rambo did. But i guess ill be trying that on some other models first too before i go bannannas on sweet old marbo. Cammo is actually not as difficult as people make it out to be, depending on what style you use. Kill and die on his shoulderpads? Neat idea. Now all you need to do is love and hate on his knuckles! He looks incredibly baddass btw. Is he actually gunna be Marbo, or your regiments killy equivalent with a diff name? Also, do you have some fluff for your army? The world they hail from?